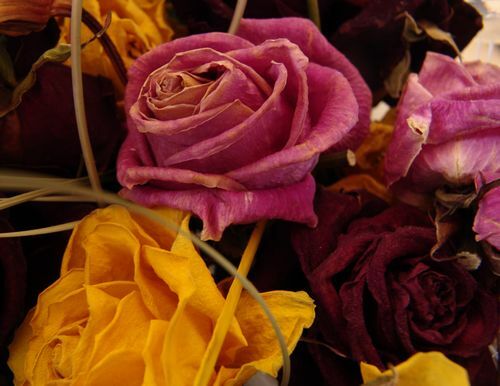 How to dry and preserve your roses for fun craft projects and floral arrangements. It’s much easier than you may think, using silica gel. Despite its name, silica gel is a solid and is usually used in granular, or crystal, form for drying flowers. Though you can use roses at any stage for this method of drying, the best is when they are almost completely open. So enjoy your roses first or purchase them on sale. Cut your stems about two inches below the bud and remove any discoloured leaves, thorns and petals. Pour approximately one inch high of silica in the plastic container. Place the rose bud on its side as shown in the photo and gently push a little silica into the petals, being careful not to break the petals. This will help your rose to dry in the same shape. If you don’t fill the petals, the rose will flatten slightly and won’t have such a pretty appearance. You can place as many roses in your container as will fit without touching each other. Now gently pour more silica over the entire rose to cover completely. Place the tight seal lid and leave your rose to dry. This can take anywhere from 7-14 days, depending on the number of roses you have placed and how much silica you have used. After 7 days, check the flowers by gently removing one from the silica to test for complete dryness. 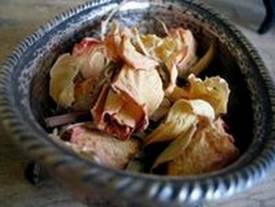 If dry remove the roses from the silica and use them in your favourite craft project. If a rose is not yet dry, just replace in the silica and allow to stand longer. You can speed up the process by placing your tray in the microwave (covered) along with a cup of water, but I find that the flowers tend to yellow slightly with this method and I don’t recommend it. However, if you are in a hurry you can use this method by microwaving at a medium setting for 1 minute intervals, checking your rose between intervals for dryness. This is the best method I have found for drying roses. Using soft pastel coloured roses and lighter shades will render the best results. Darker roses sometimes darken too much and are not as pretty. I love the results I get with yellow and pink roses the best. — Other flowers that will dry well in silica gel include asters, carnations, marigolds, dahlias, larkspur, geranium, zinnia, chrysanthemum and delphinium. — Reusing Silica Gel – don’t throw your silica gel away, as it can be reused many times. Follow manufacturer’s instructions for storage and safe usage.